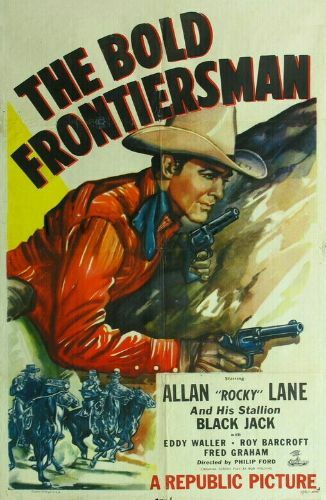 Republic cowboy star Allan "Rocky" Lane shares above-the-title billing with his stallion Black Jack in The Bold Frontiersman. Lane and his faithful mount come to the aid of a group of farmers who are attempting to raise enough cash to build a dam. Evil Roy Barcroft steals the money, but the law can't prove a thing until Lane swings into action. It's positively amazing how much production polish director Philip Ford was able to pack into his seven-day shooting schedule. Offsetting Allan Lane's dour demeanor in Bold Frontiersman is the slyly tongue-in-cheek screenplay by Bob Williams.